Another MMM favourite which I forgot to mention earlier! The Flying Change, aka Sam Jacobs, has a gorgeous full-length video created by Monte Krause for his wonderful song ‘Dirty White Coats’ from his album Pain is a Reliable Signal. I think it fits the tone of the track perfectly, and is utterly beautiful. Enjoy! It’s a dreary Monday morning here in Nottingham, but I’ve had my day considerably brightened by Miss Morrison’s Mix favourites Venice Is Sinking and their new video! It’s for their maxisingle ‘Okay’, it’s for the title track, and it’ll crack a smile across your face even if you’re still bleary-eyed and pre-coffee. Enjoy! Visit veniceissinking.net to buy the ‘Okay’ maxisingle or their previous albums, and keep your eyes peeled for more treats plus the release of their upcoming album! 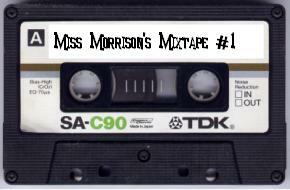 The lovely folks over at Insomnia Radio have put up a mixtape of the independent bands and artists that I’ve written about over the past few months in a nice little digital package, called ‘Miss Morrison’s Mixtape’. It’s a free download of 100% free and legal tunes, so download, copy, burn, share the music! Hopefully this will be the first of many, thanks Insomnia Radio! Get it here.